Screentool is one more suspicious program malware researchers warn to keep away from the operating system. Despite the fact that the application is not listed as dangerous, its activity is certainly questionable. As researchers have discovered, the program must be deleted as an advertisement-supported program because it may present shopping offers and other suggestions. If Screentool removal intimidates you, and you do not know where to start, we recommend reading the report reviewing the suspicious adware. Malware researchers believe that Screentool was never intended to be a reliable and legitimate program, primarily because the download link on the official website screentool.net does not work. This is the first proof you should consider having the program deleted. If you click the button, you are routed to a page indicating the error “404 Not Found”. 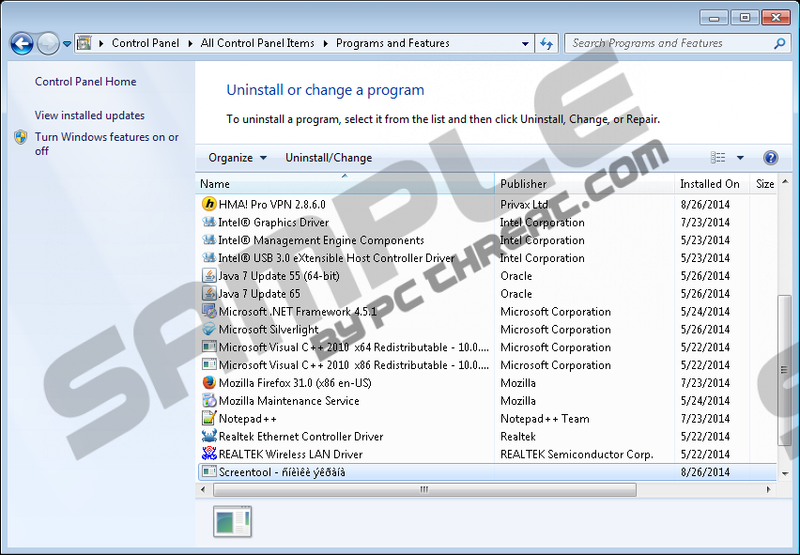 The installer of the application is hidden at screentool.net/exe/Screentool_811.exe, or it can be installed bundled with unrelated software. Either way, we suggest that you delete Screentool from the operating system. The official website and the associated privacy policies are represented in Russian, and so it is clear that Screentool will be deleted by those computer users who use the language. Unfortunately, many install and keep this suspicious program running because they believe that it will help them. Screentool is meant to help you make screenshots and share them over the Internet. However, if this was how the application operated, we would not urge you to remove it from the computer. The truth is that the program can display ads presented by parties which you should not trust. Random advertisements may be presented using different disguises, just so that you would click on them. Clicking on unreliable ads may result in the installation of malware and the activation of virtual scams. Keep in mind that advertisements may be presented to you by OffersWizzard, Info Enhance, Search Snacks, and other suspicious applications. These have been noticed to come bundled with Screentool. Keep in mind that if suspicious third-party software is running on the PC, you should think carefully if manual Screentool removal is worth discussing further. Any virtual security expert would recommend adware removal. Advertisement-supported software can install data-tracking cookies and present third-party advertisements that you cannot trust. Even though some computer users may delete Screentool manually (see guides below), it is important to keep in mind that additional threats may exist. Different threats may run in different ways, which is why manual removal is not ideal. Therefore, we suggest installing automatic malware removal software instead. Tap the Windows key to access the Metro UI menu screen and right-click. In the appeared tab click All apps for the Apps menu and select Control Panel. Locate the Task Bar at the bottom of the screen and click the Windows button. Right-click and Uninstall the undesirable application you have chosen to delete. Remove the undesirable software from the PC. Quick & tested solution for Screentool removal.